When asked why the world had not yet suffered a nuclear terrorist attack, the venerable Graham Allison of Harvard cited “grace” as the primary reason. That’s what simple cowboys, like yours truly, call “plain ol’ luck”. But what if, wondered the Cowboy, it wasn’t luck at all. What if it was actually another case of backwards causation caused by none other than: BATMAN! Holger Nielsen of the Niels Bohr Institute and Masao Ninomiya of the Yukawa Institute for Theoretical Physics recently postulated that perhaps the reason for all of the hiccups experienced by physicists in their search for the Higgs boson, a theoretical particle, might be that the particle itself doesn’t want to be created. The Large Hadron Collider has been plagued by problems, and before it the Texas Superconducting Super Collider was abandoned after being half-built. It seems that in the ever-wacky world of particle physics and cosmological theory, some serious minds are looking at the prospect of backwards causation. In other words, the Higgs boson, or perhaps time-traveling physicist gremlins, are coming back to our time to prevent it from being created. Cool, huh?! Fine, you say. The Higgs boson is a time-traveling Batman, and the Cowboy must have gotten thrown from his horse, hit his head and awakened to think that he was Richard Feynman. Has he lost his mind? What the heck does this have to do with dinner? Well, the Cowboy took Professor Allison aside after dinner and suggested that perhaps the reason we had not yet seen a nuclear terrorist attack was not grace, but rather, the Higgs boson in an act of backwards causation. I don’t think he got the joke, but he smiled politely. The Cowboy was quite amused however. Sometimes you have to laugh at your own jokes even when no one else does. I attempted to illuminate, but come on… Imagine the scene: a simple Cowboy trying to explain a convoluted and ultimately silly joke premised on particle physics, time travel and terrorism to an esteemed, gray-haired, tweed-jacketed Harvard political scientist. But the Cowboy does love the cross-pollination of ideas. At least I didn’t mention Batman. 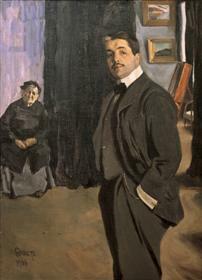 * According to official documents of the Salon de la Societé des Artistes Francais, Grün died in 1938. Other sources cite 1934 and 1945 as dates of his death). Some sources also cite the date of “Fin de Souper” as 1911. This one is another Cowboy classic. Did you write this before, after, or during drinking your caipirinhas? Makes my ahead spin almost as if I had joined you (not for dinner but for drinking caipirinhas w/ an extra shot :-).